The review of this super tweeter custom-made by Audiosmile from the UK was a great learning experience for me. I now know very well that the integration of an add-on super tweeter to any speaker system is not a trial-and-error process. There are important parameters that we must consider before choosing what type of super-tweeter will subjectively please our ears the most. In this short review, I intend not to describe my listening experiences album by album but rather, explore plausible causes for the improvements. Before Audiosmile sent me the super tweeter for review, they had performed a thorough study of the Supravox widebanders used in my Da Vinci Audio Lab Intonation speakers. Specifically, Simon examined the off-axis behavior of the driver and found it rolling off quickly by 30% starting at about 6kHz despite the driver's 20kHz reach directly on axis. This has a large effect on the power response of a system. The role of Audiosmile's super tweeter as I understand it at this stage is to fill in the total sound energy inside a given room for greater evenness. Audiosmile's job thus focuses on designing the most ideal crossover filter to match as much as possible the upper on/off-axis response of the midrange driver. In other words, this is a custom solution that eliminates trial and error -- mostly error -- for the poor customer. The following graphs demonstrate the two possible filter responses designed for the Da Vinci Intonation. The first graph shows the Supravox's own response and the general slope of the two tweeter filters. The next two graphs show the response of the Supravox summed with each of the filters. The frequency response in either case looks very flat. To compare, the muRata super tweeters I used previously begin taking over at 15kHz according to their website. Audiosmile believed the Supravox drivers would benefit a lot by lowering their super tweeter's high-pass corner frequency. 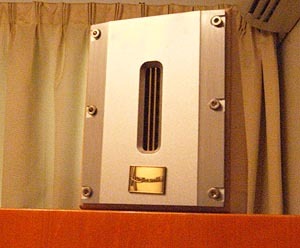 I connected the super tweeter to the amplifier terminals of the Da Vinci Grandezza 300B mono amplifier via a pair of Argento Serenity Speaker cable, to burn in the super tweeter for 2 days before sitting down for a serious listening. The custom-made solution was clearly far more seamless than the muRata. First and foremost, treble energy now filled up the whole room as though I were completely engulfed by the recording venue. This was quite shocking. In my understanding, a larger speaker cone narrows its dispersion at higher frequencies such as to become severely directional and beam like a laser. If you're not sitting directly on line with this laser beam, you won't hear the high frequencies. Simon of Audio Smile would remind us once again that we always listen to sound energy both directly from the speaker and indirectly via its in-room reflections. Unlike a laser beam, Simon's super tweeter dispersion has far wider and more even off-axis response than the Supravox has in the treble, creating a better tonal balance from a more linear power response. Put differently, the AudioSmile tweeter engages the room more actively than the Da Vinci Audio Lab speaker does on its own. That's a very good thing. Another notable but surprising improvement appeared in the bass. Transients were much faster than before. I believe the technical reason is the necessary presence of high frequencies at the very beginning of bass notes. Think of the kick drum in a drum kit which consists of the low frequency component from the oscillating drum skin and the high frequency component when the head of the pedal first hits. For the first split second when the pedal hits the drum, the development of the leading edge (high frequencies) begins until the skin of the drum slows down to its natural resonance frequency. Delivery of lower mid-bass notes is thus much cleaner without losing speed and impact at all. missed a complete section of mid-high frequency harmonics which were blanked out by comparison. Yet improved bass transients survived with it. Tonally, however, its effects on the bass were a little bit leaner than the Audiosmile. With respect to the physical super tweeter (10.5 x 13.5 x 8 WxHxD cm), the ribbon element is an isoplanar said to enjoy incredibly low distortion and very fast decay rates. Frequency response extends to 45kHz and horizontal dispersion is apparently extremely wide and even. 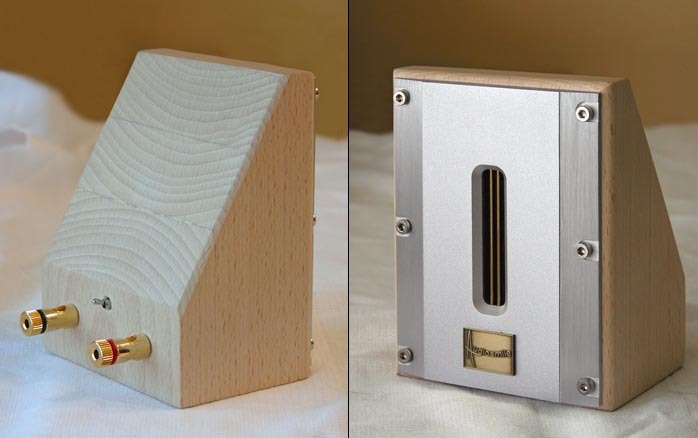 The demo pair enclosures I bought were made from solid Beech. Cherry and Ash are the two standard finish options. All Audiosmile super tweeters are made to order and by hand. The 'red' filter is a more gentle 2nd order and the 'blue' a sharper 3rd order filter. Simon anticipated that the 'blue' filter would work better for me as it protects the super tweeters a little more and also gives a bit more high frequencies where needed. He will perform the same computer modeling for every customer serious about his super tweeters. I now perfectly appreciate how without this matching feature, perfect integration between midrange and super tweeter is a completely haphazard affair and very unlikely to happen with a one-size-fits-all stock offering. Simon's filter compensations for my application are so well chosen, I believe Da Vinci Audio should deliver the Intonation speaker with this Audiosmile tweeter as a standard package. It really elevates the total performance of their Intonation speakers. With respect to price and how it impacted my performance, this super tweeter seems like a real bargain to me. Sidebar 1: Super tweeters have gained more respectability though the precise reasons for their apparent efficacy are likely not fully understood yet. That hasn't prevented an informal body of evidence to get assembled by those who have actually experimented with such devices. Universally, the subjective improvements are reported as rather more far-ranging than merely 'better treble'. From among the vendors of super tweeters I'm aware of, Simon at Audiosmile seems the first (only?) to focus his explanations on an improved power response, i.e. the composite (overlaid or summed) totality of direct and reflected sound. Drop-outs in reflected energy where the room doesn't support the speaker's direct radiation as it does above and below the gaps are far more audible than intuitive perhaps. As an owner of Mark & Daniel's Maximus Monitor with the optional ambient air motion transformer (upfiring into an omni dispersion lens, high-passed at 3kHz), I'm familiar with its effects on air (audible space), soundstaging (apparently bigger) and improved definition in the lower bands (stronger focus). I have also experimented with an add-on fixed-network muRata to find, as Linnman did, that it worked better on some speakers than others. While DIYers in particular will, as they always do, reference only Madison Sound or equivalent price sheets for raw drivers, the vital feature of Audiosmile is the computer-modeled custom high-pass filter. While duplicating it will still be within the ken of more advanced DIYers, it won't be for others. And non-DIY customers of course are interested only in turnkey solutions that provide the best results. To my knowledge, Audiosmile is unique in offering this custom-matching feature, hence it's a fair assumption that unless competitors step up to the plate, Simon's super tweeters will outperform them - unless those others just happen to match your speakers' native response to the 't'. In which case, all bets might be off. Whether you're inclined to take that risk though is another matter altogether.